Theatre, talks, Bloomsday – and a bit of music. A busy fortnight. Last week, William Dalrymple at Pitt Rivers, talking about the last of the Moghuls. Great evening. I may well become a friend of PR! Yesterday, Dr. Mustafa Barghouti and Avi Schlaim at St Anthonys discussing Palestine. This evening – and this I am really looking forward to – the Oxford Chavad Society has invited the Provost of Worcester, Jonathan Bate, to give a talk entitled Shakespeare and the Jews. And still on the subject, June 16, I’ll be at the Martello Tower in Dublin’s Sandycove to hear readings from Ulysses by actor Brian Murray followed by wine and some music by the local ukulele band in Glasthule village. Where to have coffee in Oxford. In fact, there are lots of places to have a pleasant cup of coffee ( or tea) in Oxford but the cafes listed below are all places I have visited. Plus 1) they are all independently run and 2) not expensive. 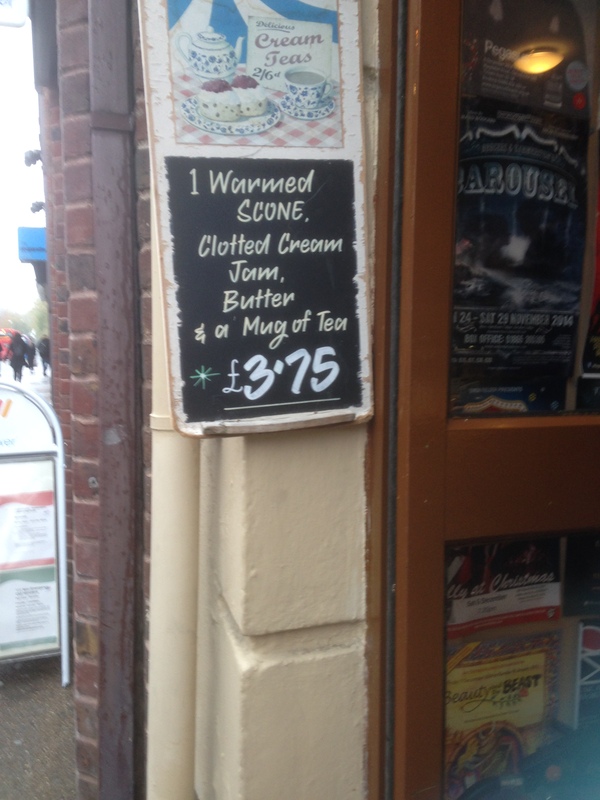 The average cost of a cappucino works out at £2:50 and some are less. 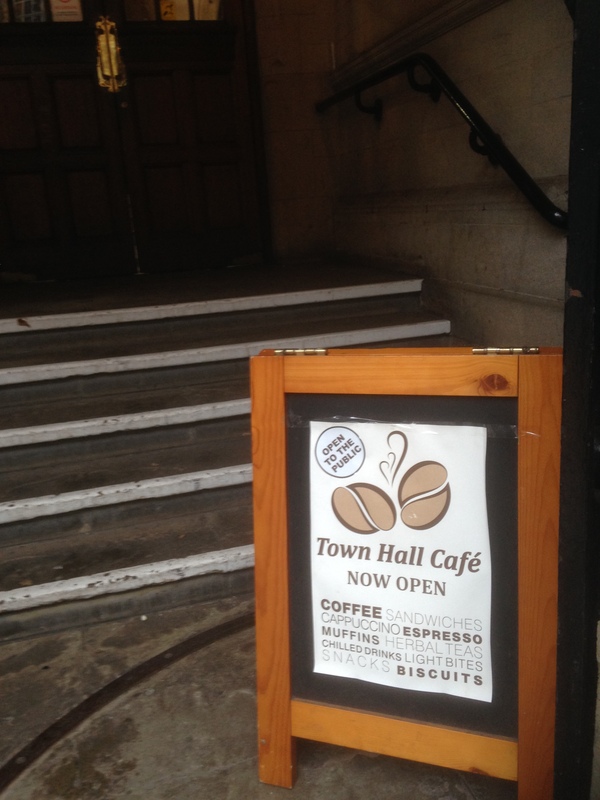 First off is the cafe in Oxford’s Town Hall, in St Aldates. A modest little cafe tucked away within the Town Hall where they serve buns, croissants, brownies and everyday cheese and ham sandwiches. It’s very central and a good place to drop into to recharge the batteries. Watch out for it on the way to Christchurch Cathedral and for your walk around Christchurch Meadows. 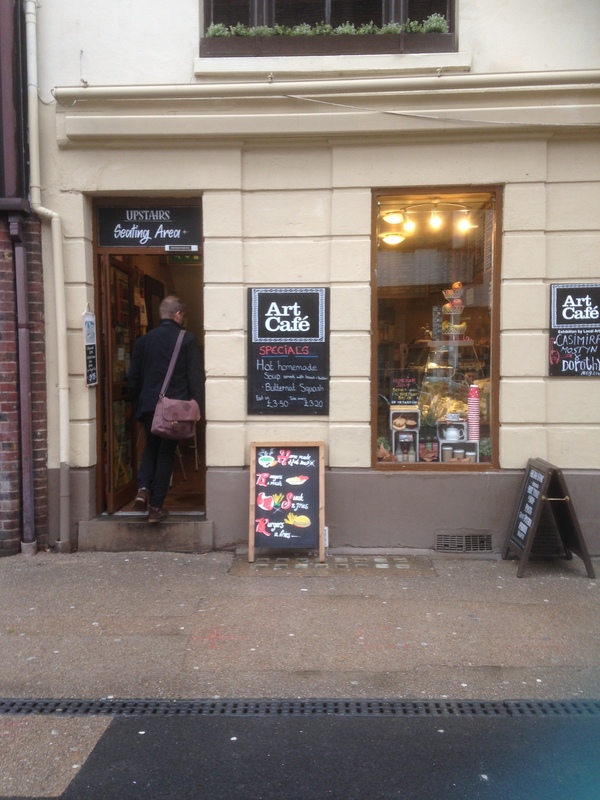 Near Westgate Shopping Centre, is a place I sometimes go to early in the morning and after I’ve been to the gym – the Art Cafe. You get your coffee downstairs and carry it upstairs. Lots of food on offer here served by very cheery staff. 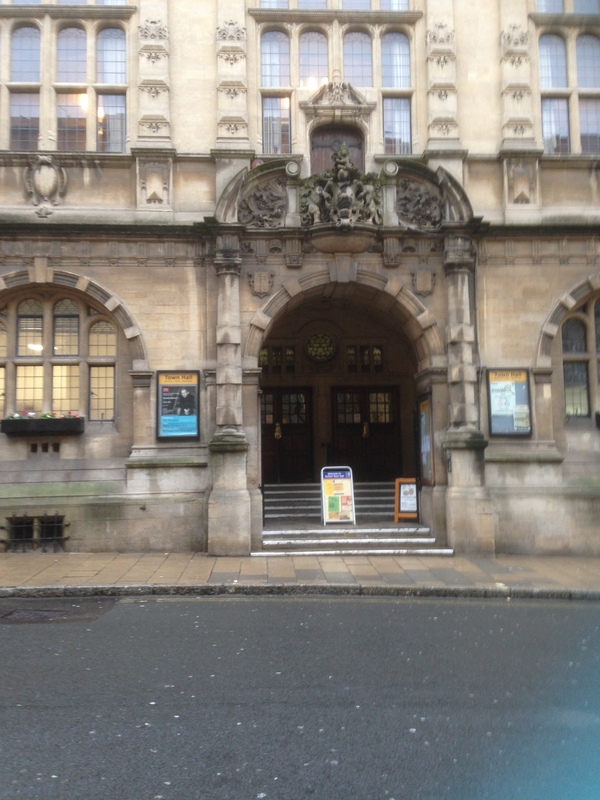 It’s handy if you want to drop in to Oxford’s Central Public Library. Here’s what’s on offer though there’s lots more inside. And if you’re a cyclist ( who isn’t in Oxford? ) 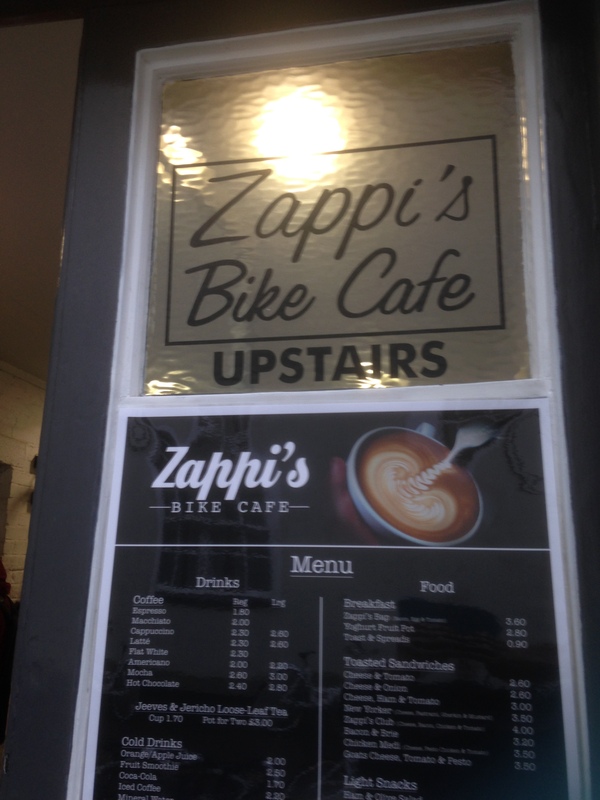 you might like to head for Zappi’s on St Michael’s Street. Downstairs, it’s a bike shop, upstairs it’s a cafe. 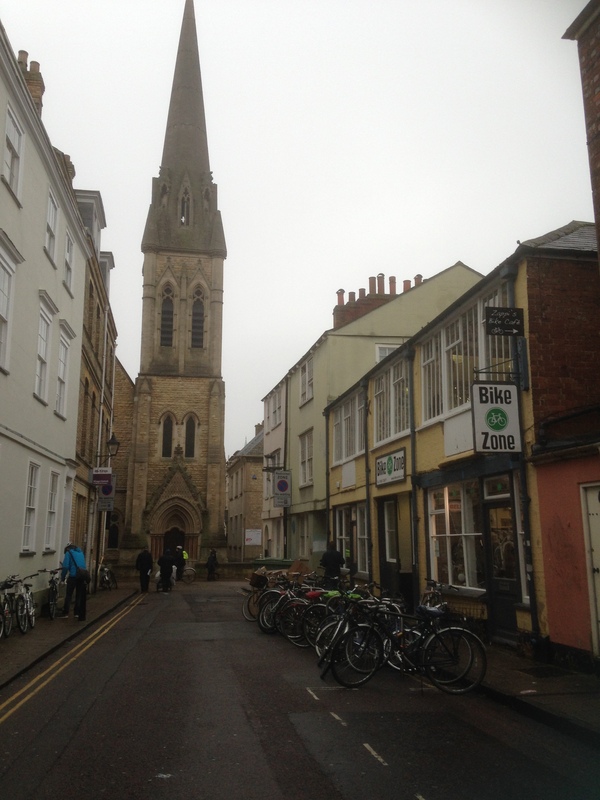 Cornmarket at the other end of the street. John Wesley, the founder of Methodism, preached here. On a Sunday morning, the street is packed with cyclists decked out in their lycra, ready to speed off into the countryside. Here’s the entrance to this august place. 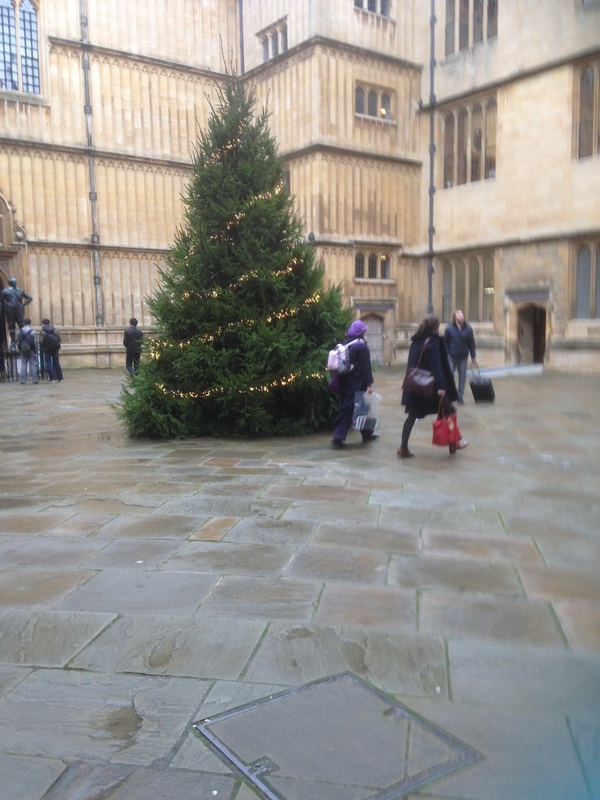 And because I took these pictures last winter, I’ve included the Bodley Christmas tree. Finally, and I know I’m cheating here as the sign relates to the Christmas Market on Dublin’s Stephen’s Green, I’ve included a billboard that speaks for itself, though you’d have to be in Dublin to test its veracity. 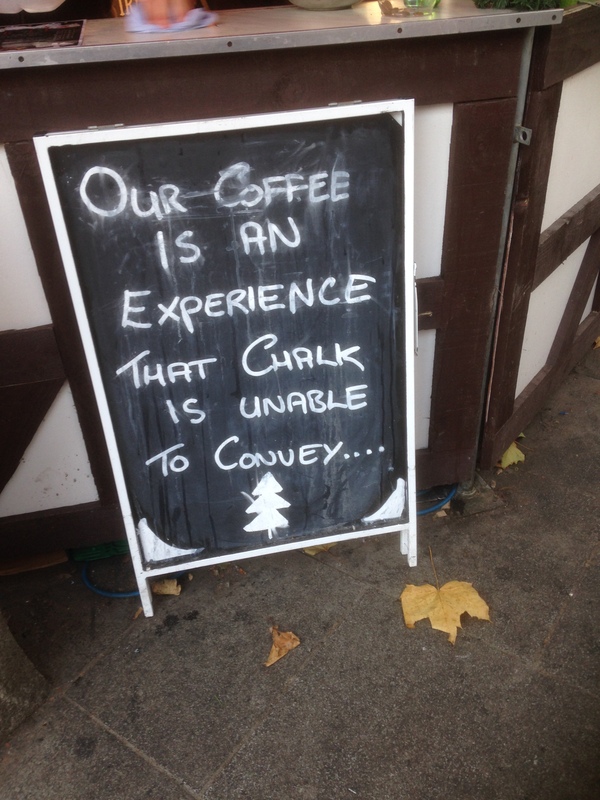 But, as we say, in coffee veritas. Or something like that. 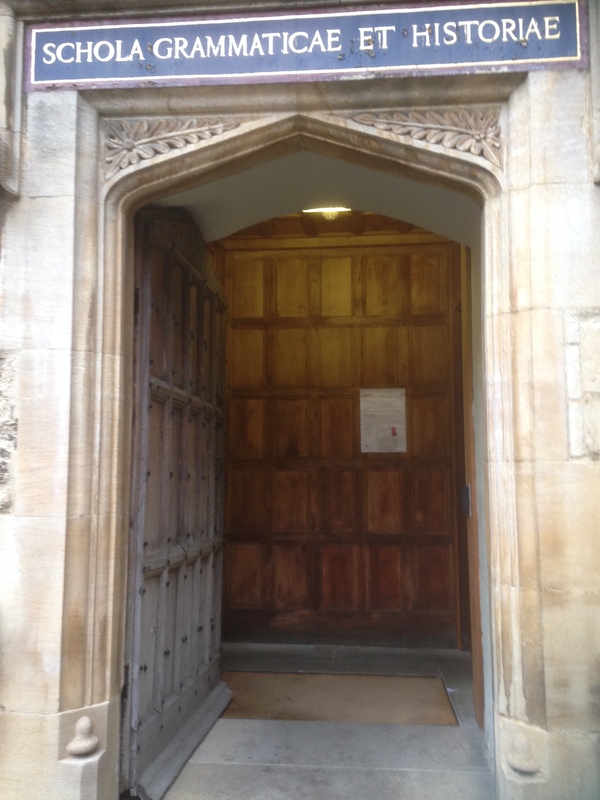 Got to the Bodleian yesterday evening about 16:30 when the sky overhead was a deep, luminous blue which surely meant snow. The book I had ordered was there, waiting for me in the Radcliffe Camera. Normally, for books on the open shelves, readers help themselves but we are temporarily barred from the lower Gladstone Link, due to a leak, and so enjoy the luxury of our books being carried up the metal stairs for us to the Camera. The book I wanted was Travel A Literary History, by Peter Whitfield, published in 2011, by the Bodleian itself and available in the library’s excellent shop. As with all books ordered, I did a skim read. 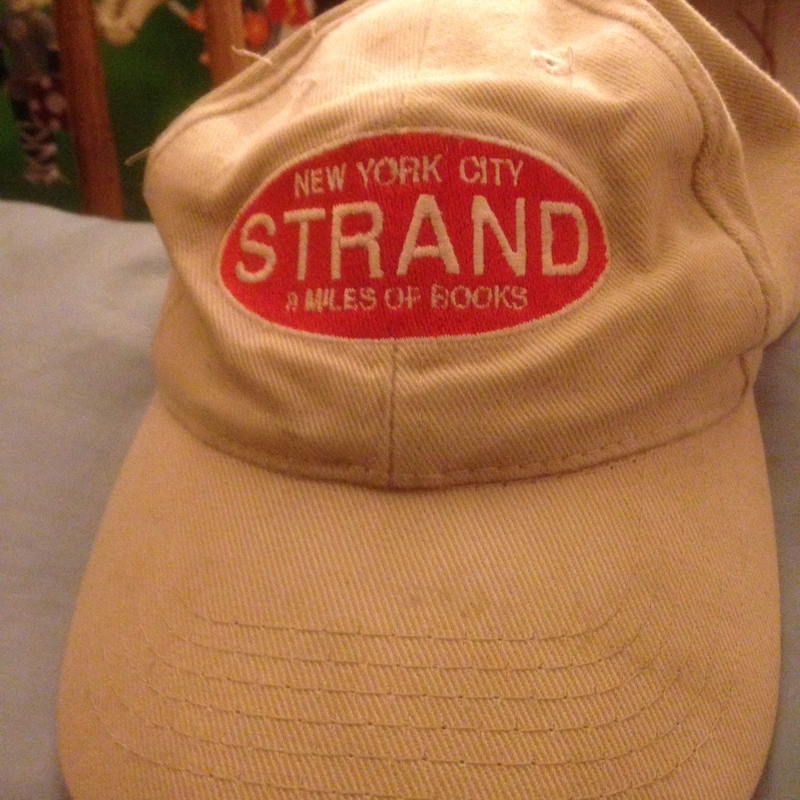 Byron is there as is Joan Didion, Dante, Hannibal, Sara Wheeler and Jan Morris among many others. I’m not. (Yes, I checked. I am human, after all.) Egeria is there though Whitfield is a bit dismissive, saying that she tells little about the places she visited. Not so. Earlier this year, I sat in a shaded monastery garden outside Jerusalem, with Earl from the Falls Road, though now known as Gregory, Abbot of the Benedictine Monastery in Jerusalem’s old city. He knew of Egeria ( full marks, Abbot) because of her writings which are greatly valued as being among the earliest first-hand accounts of 4th century liturgy. Her descriptions of the rich hangings and drapes alone are worth reading. She also comments on the plants grown by the monks and on their irrigation systems. You can read more about her in my book The Blessings of a Good Thick Skirt ( http://www.maryrussell.info) . You can also read, in Blessings, about Margery Kempe, the noisy, obstreperous, talkative and, at times, infuriating pilgrim who travelled on foot and by boat from England to Jerusalem in 1414. Strange that she too has been left out of Whitfield’s so comprehensive book. By the way, if I’ve whetted your appetite, you’ll find the radio documentary I made about Margery also on my website. So Egeria is here as is Saint Brendan but not, and understandably perhaps, Saint Ia who sailed across the sea on a leaf from Ireland to Cornwall to found the settlement of Saint Ives. Or so I’ve been led to believe. Whitfield’s book will demand time and attention which I didn’t have last night but I will be back. Not only to read Travel but also to read his upcoming book Mapping Shakespeare’s World, also published by the Bodleian. This is going to be a fascinating read as it looks at the way in which Shakespeare locates his plays in places he had never – nor could have – visited, such as Verona, Elsinore and Ephesus. The play I’m currently interested in is Othello, set in Cyprus and in which play Shakespeare moves dates around to suit his dramatic purposes. The Ottomans would have had a right to complain but they didn’t. Instead, they welcomed the Elizabethan travelling salesmen with open arms. And why not? Everyone wanted to hang their palaces and churches with silk from Damascus.Or clothe themselves in the precious silk: Anne Boleyn wore a damask mantle when she went to her death. Strange then that, in Whitfield’s book on travel and literature, there’s no mention in the index of Aleppo or Palmyra or, saddest of all, the great city of Damascus. But here, cue my latest book My Home is Your Home http://www.maryrussell.info which tells you not just about the city and the country but the people who make up that country. Published in 2011 it is now a record of times past. I will be back in the Bodleian to read more of Peter Whitfield’s travel book but first there’s my bookclub book to finish: Rose Tremain’s The Colour. Then there’s a book review to write for The Irish Times: Leaving Before The Rains Come, by Alexandra Fuller whose Let’s Not Go to the Dogs Tonight, I reviewed and loved. And finally, there’s a post-Christmas gift: Karen Joy Fowler’s We Are All Completely Beside Ourselves. These may keep me going till Mapping Shakespeare’s World is published in June by which time it will be top of my reading list. I first went to the Turner Prize Winner exhibition the year Damian Hirst won and it was brilliant. His take on isolation ( the dots) and separation ( mother and offspring at birth) got me thinking. Separation is something we all experience and have to deal with.His bisecting of a cow, of course, drew criticism. He was trying to shock, people said. Maybe he was, shock us into thinking about this most primal moment when we are expelled from our mothers’ bodies into an unforgiving world where we experience cold, hunger and instability. Shocking. But this year’s exhibition did nothing to reach into the void. The winner is Irish-born Duncan Campbell who expounded his theories about capitalism in a leaden dull way. Videos dominated, accompanied by a monotone commentary. The commentary was sometimes too fast to understand and the superimposed text illegible. Marxist theories were offered which, unless you knew something of Marxist equations, meant nothing.Most Marxists I know are incapable of dialogue and deal only in monologues in which there is no space allowed for an outside contribution. This was no exception. One theory offered was about the way in which icons are commercialised to the point at which they no longer stand for their original statement. But for Christ’s sake, anyone who has been around for a few years already knows that the ban the bomb sign or the black and white keffiyeh worn by Yasser Arafat have been reproduced as fasion items which have no connection to their original political statement. Are the judges of the Turner Prize that far removed from life that they themselves were unaware of this? Campbell states that museums have now become, not simply the guardians but the owners of foreign artifacts. This comes from the refusal of the British Museum to give him access to artifacts from Benin so that he had to use reproduced images of them rather than filming them for his video. But Africa, the victim of colonialism and thereby relieved of its cultural treasures, is the easy option. Why did he not look closer to home. Not exotic enough, perhaps. Had he taken a trip to Oxford’s Bodleian Library, he would have come across plenty of illuminated manuscripts, from Ireland, which have been “acquired” by the Bodleian. And so the viewer is left with the impression that Duncan Campbell has been living in an ivory tower where his politics have gone unchallenged. Think the Young Ones – remember them – and you get the idea. No, the prizewinners exhibition has been a disappointment. Worse, it is boring. Read any good bags lately? 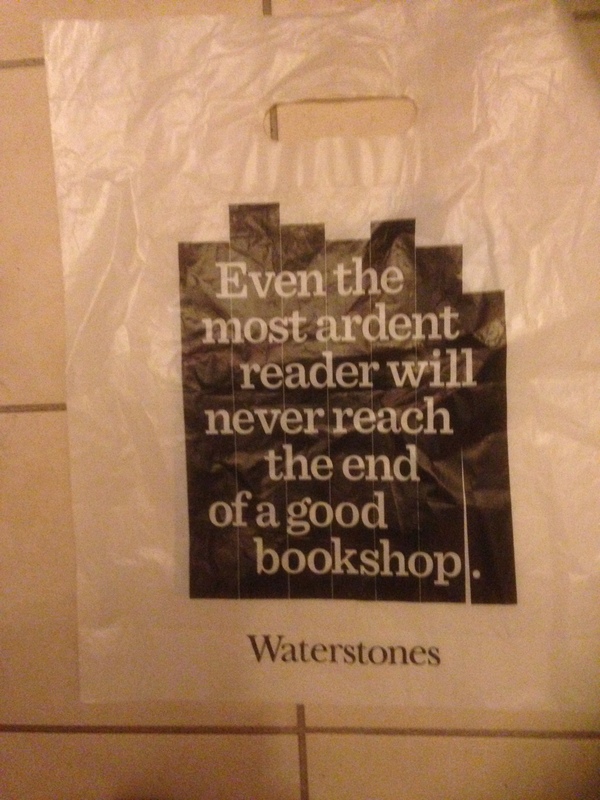 Check out your book shop bag…. 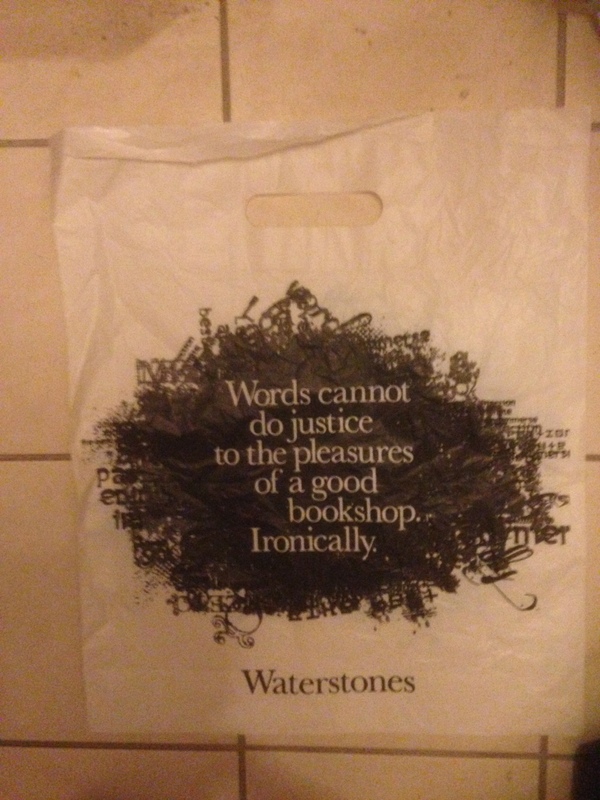 I’ve occasionally bought books and found the bags they come in have something witty to say. 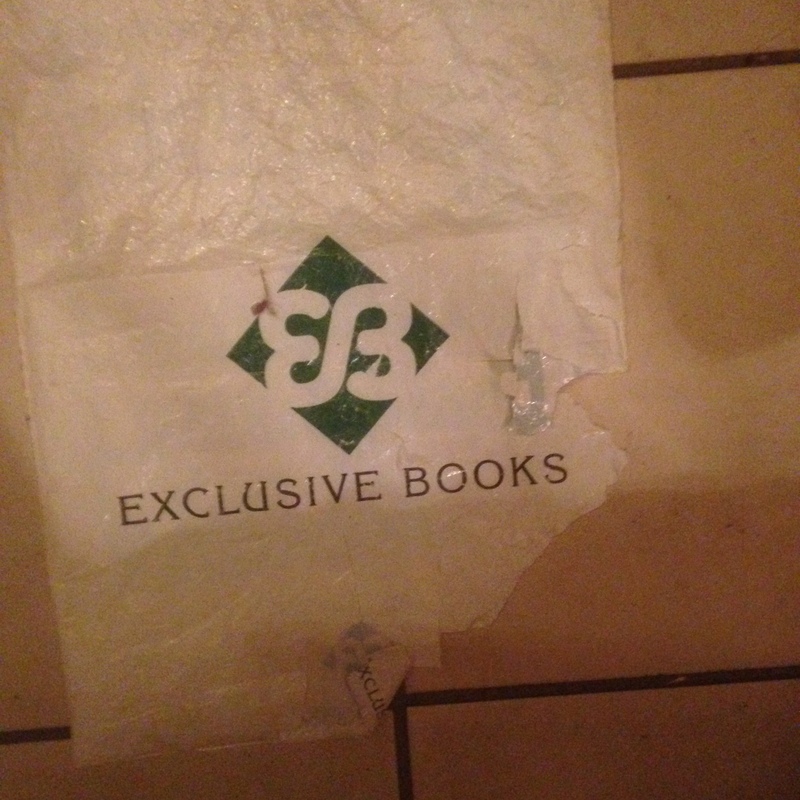 Below are a few – from bookshops in Dublin, Oxford, Johannesburg and New York. 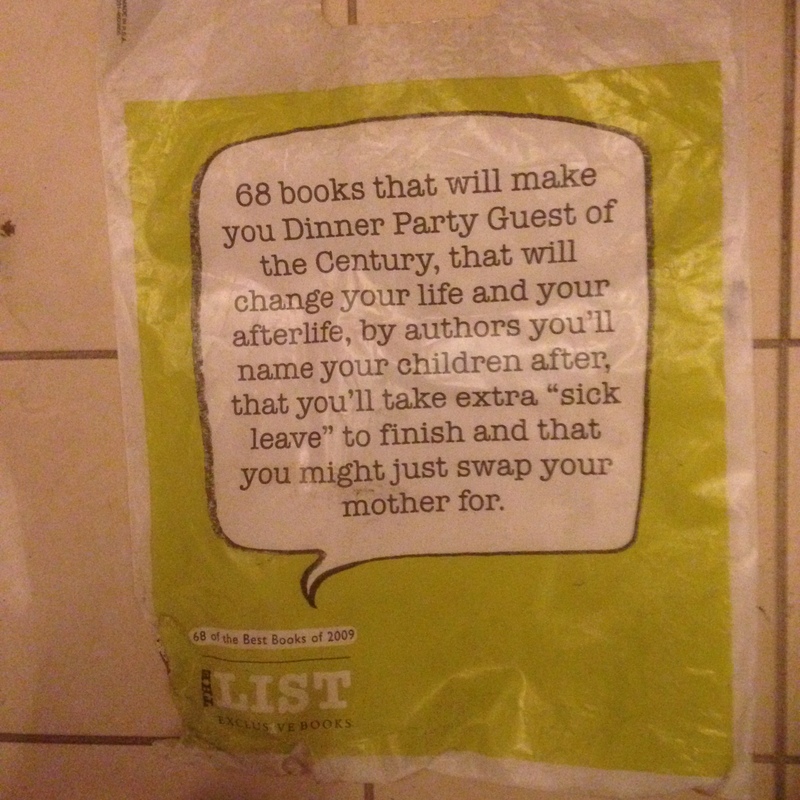 They’ve been stuck up on my kitchen wall for quite a while – which will explain some of the crinkles. 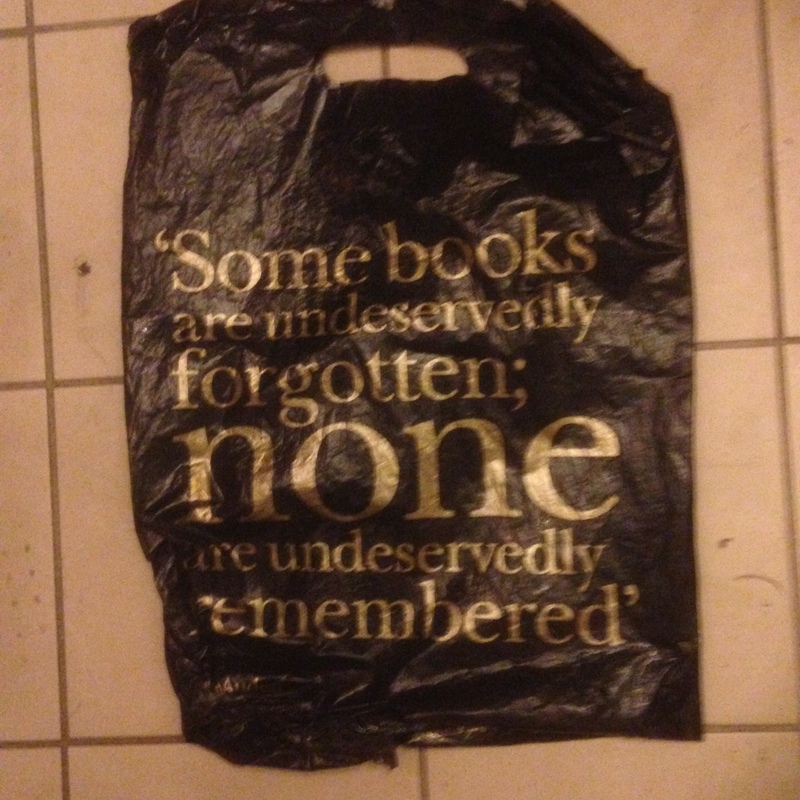 Next up: This reads: Some books are deservedly forgotten; none are undeservedly remembered. 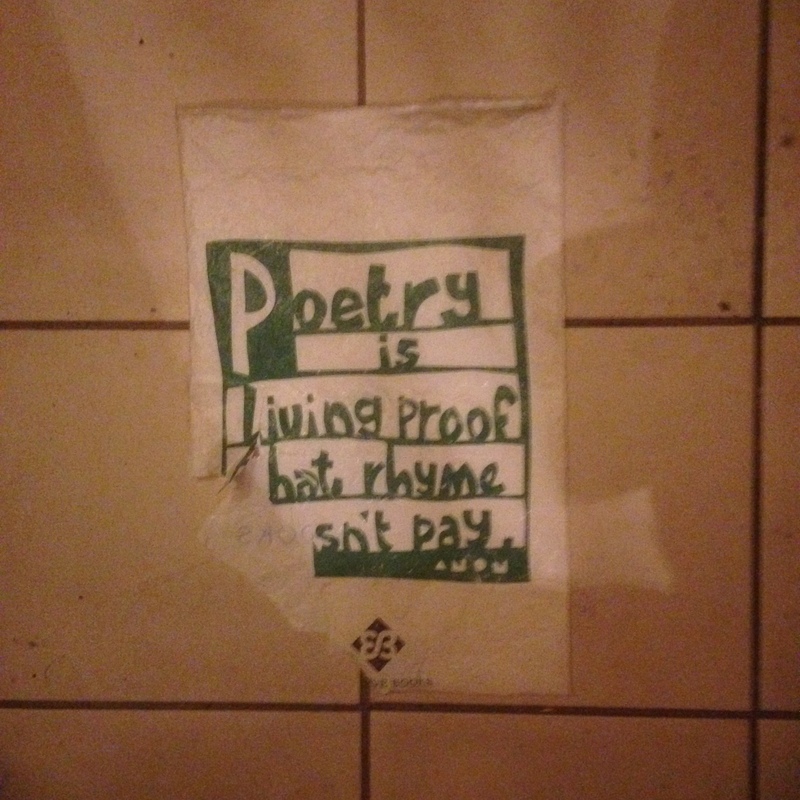 A heartfelt one: “Poetry is living proof that rhyme doesn’t pay.” This was from a bookshop in Johannesburg. 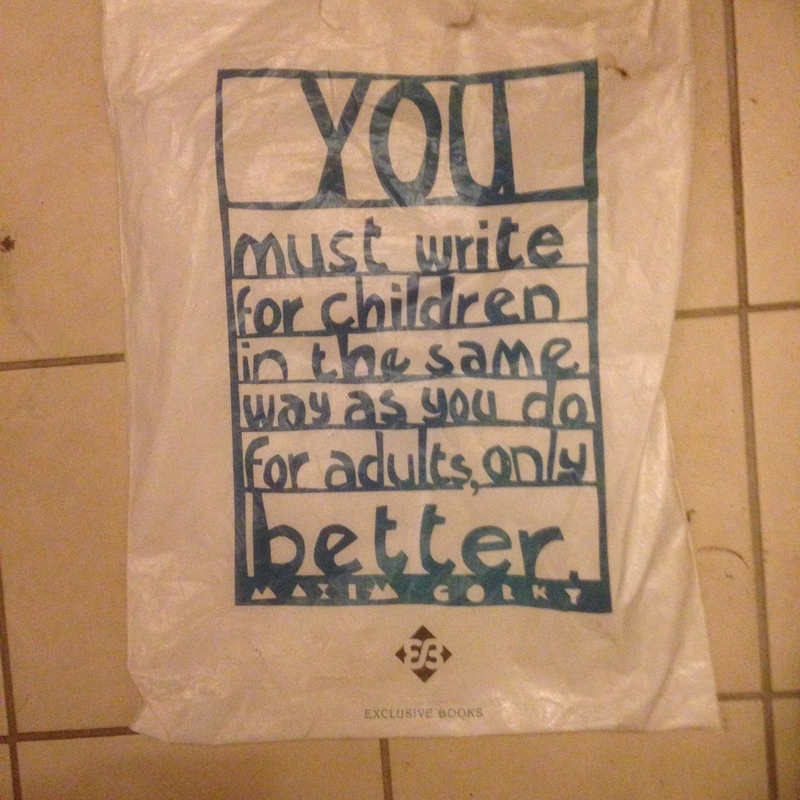 and this is the back of that bookshop bag from JoBurg – Exclusive Books. Yep, that’s 8 miles of books.